ABC Halloween [C6435] - $9.00 : Yarn Tree, Your wholesale source for cross stitch supplies. Cross stitch pattern by Jardin Prive. 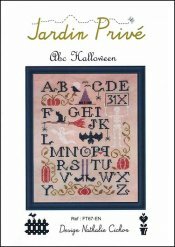 Halloween themed alphabet sampler featuring bats, pumpkins, ghosts, skeletons, and other motifs. Stitch count 103w x 137h. Stitched on #7509 Aida 20ct country mocha.